The 6th Day is so aptly named because it deals with a subject that threatens the sanctity of a fundamental cornerstone of our religions. Then we have present day, with the mapping of human DNA, and the cloning of sheep. What would be the logical next step, this movie proposes, is the cloning of humans. This is roughly how the movie begins, with such a history lesson. It then takes us to a point in the not-too-distant future to fantasize about what could very well be our reality. Not that the movie gets excessively deep and controversial; it is for the most part a fun thrill ride. But it definitely leaves no stone unturned in its effort to get us to think about such fascinating and frightening possibilities. There were several things that I got out of this movie. First and foremost, as mentioned, I got some food for thought. "Gum for thought" would perhaps be a better phrase, since it is something that one could chew over and over in his mind. But a simple novel or short story could provide such things. What this movie really succeeds at is allowing us to experience these possibilities. And we not only experience the future of cloning, but of technology in general. Some of my favorite scenes from the movie are those that showcase common household appliances of the future. For instance, there is a scene in which Adam Gibson (Arnold Schwarzenegger) is standing at the kitchen sink...shaving. But not only is he shaving, but he is watching the news on a holo display on his mirror, as well as surfing the Internet...on his mirror. If my memory serves me correctly, he also has a video-phone conversation on his mirror while shaving. I love stuff like that! I eat it up! There are also cars that drive themselves, football helmets that have digital readouts of statistics to aid the players as they play, giant holograms, remote-control helicopters...I could go on and on. I also especially enjoyed the virtual girlfriend. It is intriguing, laughable, beautiful, and, as Arnold comments, "disgusting." So we have fascinating and controversial topics being brought to life (Now that's a great pun!). We have great action (what Schwarzenegger movie doesn't? Oh yeah, Twins, Junior, ..., but this one is pretty good...trust me). And what is more, we even have touching and sentimental scenes as well. Great ideas. Superb special effects. 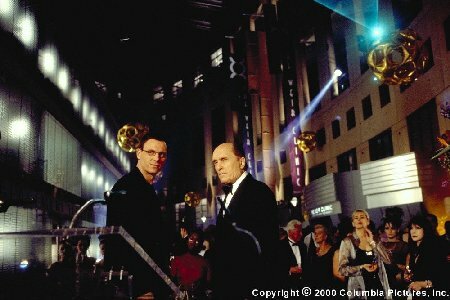 There was even some pretty good acting turned in by Schwarzenegger and Robert Duvall (as Dr. Weir). However, the one point which brought it down was a sub-par performance by Tony Goldwyn (you may remember him as the bad guy in Ghost or as the voice of Tarzan in Disney's animated film). Here, Goldwyn is ruthless, heartless, and philosophical, as any bad guy should be. But he was also one-dimensional and somewhat ineffective. Another not-so-great performance was turned in my Michael Rooker (who was Rowdy from Days of Thunder). His character was pretty significant to the film, but he made it look like he was an afterthought. All in all though, I was quite pleasantly surprised by this movie and would see it again for the special effects and the mind-bending conversations I could have with whomever I watch it with. 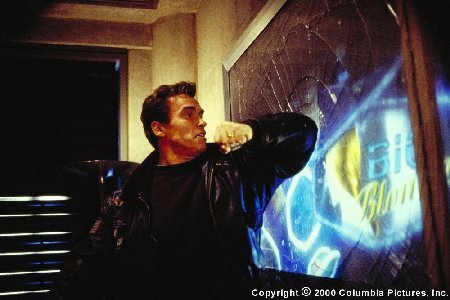 As for a comparison with Arnold's other movies, I could only really compare it with T2 or Total Recall. The 6th Day definitely holds its own, but the other two would probably edge it out. T2 had a great story and a menacing and memorable villain. Total Recall created a much more outlandish environment and effects. In all three, however, you get that one-man-against-the-system kind of feel, which I love (in The 6th Day's case, it's a one-man-and-his-clone-working-together-against-the-system kind of feel). A great movie. If you like futuristic, yet realistic, movies, then this one's for you. 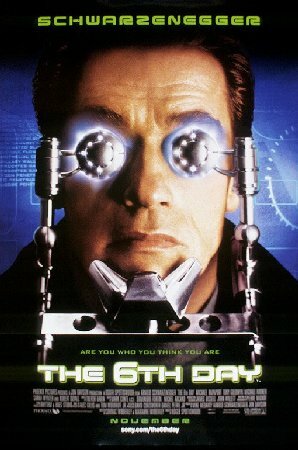 How would you rate the movie The 6th Day? There have been 8204 people to visit this page since Sun, Nov 26, 2000. And you are the first person to visit this page today!